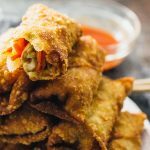 These vegetable egg rolls are ridiculously crunchy and taste better than any Chinese takeout version. They make for a popular vegetarian appetizer, and they’re easy to assemble and cook. Add mushrooms, carrots, cabbage, and salt to a large pan over medium heat. Cook until the carrots soften, at least 10 minutes, stirring occasionally. Drain the pan's vegetables and transfer to a large bowl. Add minced garlic and mix well. This will be the egg roll filling. Lay out the egg roll wrappers with their corners facing you and a small bowl of water. Distribute the egg roll filling among the wrappers, scooping it onto the bottom third of each wrapper. Taking one wrapper at a time, use a finger to brush along its four edges with water. Fold up a corner over the filling, then the sides, and then roll it up. Dab the last fold with more water to seal. Repeat for all other wrappers. Add canola oil to a large pot until the oil is about 1 inch deep. Turn the burner to medium heat. When the oil temperature reaches 350 F, add the egg rolls in batches. Fry until golden brown, about 3 minutes. Transfer to a paper towel to drain. Combine sauce ingredients in a small bowl. Mix well. Serve with egg rolls.